Guido Guerzoni presents the results of fifteen years of research into one of the more hotly debated topics among historians of art and of economics: the history of art markets. Dedicating equal attention to current thought in the fields of economics, economic history, and art history, Guerzoni offers a broad and far-reaching analysis of the Italian scene, highlighting the existence of different forms of commercial interchange and diverse kinds of art markets. In doing so he ranges beyond painting and sculpture, to examine as well the economic drivers behind architecture, decorative and sumptuary arts, and performing or ephemeral events. Organized by thematic areas (the ethics and psychology of consumption, an analysis of the demand, labor markets, services, prices, laws) that cover a large chronological period (from the 15th through the 17th century), various geographical areas, and several institution typologies, this book offers an exhaustive and up-to-date study of an increasingly fascinating topic. Guido Guerzoni, a specialist in economic and social history, teaches Cultural Management at Universit\u00e0 Bocconi in Milan, Italy. He is the CEO of Polymnia, a nonprofit company part of the Foundation of Venice, which is building the M9 museum in Venice-Mestre. 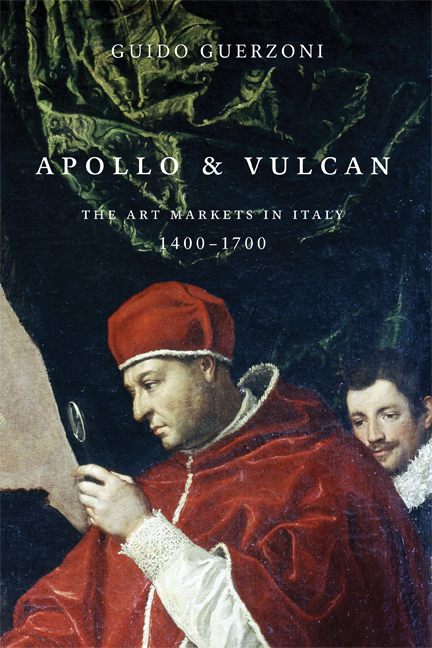 "Until recently, an insurmountable wall divided the study of art history and the history of economics…[Guerzoni’s] latest book, a summary of several research approaches toward art markets in Italy between 1400 and 1700…offers a rich store of data and information." "Guerzoni has published an important contribution, a new approach that ties together heterogeneous research areas in the fields of art history and the related history of economics. […] This is a watershed study, presented with an elegant narrative approach full of surprising facts and conclusions." "Guerzoni invites us to examine the nature of these economies from a fresh perspective. Through a systematic approach based on a thorough study of original documents and archival sources, he sweeps away several misconceptions and clichés…about the politics and esthetics of ‘art consumerism’"